One of the most important seasonal property services for winter in Rhode Island and Massachusetts is snow plowing and removal. If you have customers, clients, or tenants visiting your property during the winter months, it is important to make sure that your driveway, parking lot, and walkways are cleared. Not only does this contribute to your business by providing a means for customers to make their way to your store, but it also helps to protect your business, by keeping your property safe. Slips and falls on snow and ice in the winter cost American companies millions of dollars each year in liabilities. Prevent these incidents from happening on your property by hiring our full-service Rhode Island hardscaping and landscaping service year-round. When you start looking around at professional companies for snow plowing and removal, look no further than Eastern Landscaping, Inc. In addition to landscaping and hardscaping design in Rhode Island for commercial and residential clients, we also provide a variety of seasonal property services that include snow removal contracts, sod and seed, fall clean-up, and spring planting. Whatever your needs for Rhode Island hardscaping, landscaping, and related property maintenance, you can count on Eastern Landscaping, Inc. to provide you with professional and reliable results. Communication is Key – A good snow plowing and removal company needs to be available at all hours for service. Businesses that open up early in the morning require seasonal property services for snow and ice removal hours before the first employee or customer even arrives. If you don’t get this service contract for your commercial property, you might miss out on customers simply because they won’t be able to drive onto your property or park at your store. It is important that you can contact the snow plowing and removal company at all hours or that you have an understanding in place about your needs so you won’t lose out on any wintertime business. You also need to be able to get ahold of someone quickly if you need an extra removal in between scheduled services or if an area of your property accidentally gets missed. Make sure to speak with a representative when you plan your services, so you understand what you need to do to contact our team for snow removal. Effective & Efficient – These two aspects of quality seasonal, landscaping, and hardscaping design in Rhode Island that go hand in hand include being effective and efficient. Effective service is important. You don’t want to have to contact the snow plowing and removal service repeatedly because parts of your parking lot or driveway keep getting missed. When you first meet to talk about seasonal property services, make sure to go over what you need to have done, the areas that are most important, and any concerns about issues with past services. Efficiency is also important. 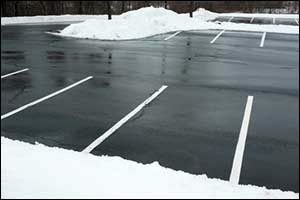 You don’t want them out there for hours plowing your driveway with customers or employees waiting to get inside to park. Attention to detail and reliable services should be the hallmark of any property maintenance service, so make sure you know what you are getting before you sign on to a contract. Timely Services – While we touched down a bit on reliable services and timeliness in the section on communication, it cannot be stressed enough how important it is to have a snow plowing and removal service that comes when you need them to come. Much of the snowfall that we get in New England occurs in the early hours of the morning, so it is critical for snow removal contractors to get out there and start removing the snow and putting down de-icing treatments very early in the morning before most stores and services open for business. Make sure that your Rhode Island hardscaping, landscaping, and snow removal contract service provider knows your business hours. That way, they can work around your schedule to have your property looking its best each day before your customers arrive. If you are interested in learning more about our commercial seasonal property services for businesses in Southeastern Massachusetts and Rhode Island, make sure to give us a call at 401-766-9035. We can answer any questions that you might have about snow plowing and removal services or provide you with information about our landscaping and hardscaping design in Rhode Island and the surrounding area. Call today and make sure that your property is protected from snow and ice liabilities this winter.